There are two versions of Pure Power Appliances. Drs Paul and Adam Hahn create an appliance designed for non-impact sports like baseball, golf, soccer, and weight lifting that is worn on the lower jaw. This is called the Pure Power Edge (Displayed to the right). 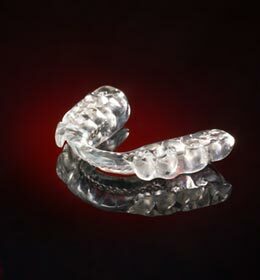 This device is also used while training for impact sports, because it is less cumbersome than the upper appliance PPM. What is the PPM™ Concept? Both the Pure Power Edge and the Pure Power Mouth Guard™ help to properly align the facial muscles, improving muscle recruitment and vertebrae alignment. If your jaw and neck muscles are not strained from a poor jaw position, your upper cervical muscles are free to work much more efficiently and to their fullest potential. Simply put, the PPM™ results in improved strength, flexibility, and balance and is helping athletes maximize their performance all over the country. (803) 781-9090 or contact us online. Neuromuscular dentistry is the dental specialty that works to alleviate headaches, neck and shoulder pain, jaw pain, clicking or popping noises of the jaw, and tinnitus (ringing of the ears) by achieving better alignment of the jaw. Misalignment of the bite is known as “malocclusion” and can be very painful. Neuromuscular dentistry focuses on the physical connection between the range of motion of jaw muscles and joints and your body posture. Dr. Paul Hahn and Dr. Adam Hahn of Smile Columbia have the specialized training necessary to assess your jaw problem and create a treatment plan that will change your life.